Recognition is based on National University’s pioneering spirit of developing innovative programs to serve the unique needs of diverse students, including adult learners, and for introducing innovative research-based programs to PreK-12 schools. San Diego, CA, – The private, nonprofit National University is being honored with the 2017 Visionary & Outstanding Leadership Award from the nonprofit, Classroom of the Future Foundation, marking the first time an educational institution has received the award. 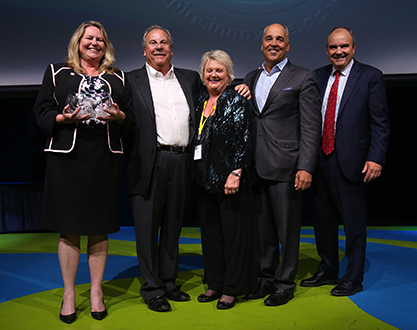 National University leadership accepted the “Visionary & Outstanding Leadership Award” from the Classroom of the Future Foundation at the 14th Annual Innovator in Education Awards May 24, 2017 at SeaWorld in San Diego. The University is being recognized for its leadership in offering innovative programs that serve PreK-12 classrooms; for being a strong community partner; and for its pioneering impacts in serving the higher education needs of diverse students, including adult learners. National University will be honored during the group’s 14th-annual Innovation in Education Awards at SeaWorld on May 24. “National University is pleased to accept this award that both recognizes our founding vision and encourages us to continue our dedication to creating the most truly personalized student experience for each of our graduates,” said National University President Dr. David Andrews. National University launched in 1971 to meet the diverse needs of adults when its founder David Chigos, a retired U.S. Navy Captain, identified a need for a university education format to serve working adults, including those in the military. Since its start, the University has grown to house four schools and two colleges – the College of Letters and Sciences; the Sanford College of Education; the School of Business and Management; the School of Engineering and Computing; the School of Health and Human Services; and the School of Professional Studies. The Sanford College of Education, which was renamed in 2015 in honor of renowned philanthropist, T. Denny Sanford, has grown to become among the top ten largest schools of education in the country and confers more education master’s degrees each year than any other California university. The College is also ranked second in California and fifth nationally in granting master’s degrees in education to all minorities. The Sanford College of Education has earned accreditation by the esteemed National Council for Accreditation of Teacher Education (NCATE) and has produced over 100 county teachers of the year in California. “We are honored to receive this recognition from the Classroom of the Future Foundation, which also represents our commitment to leadership in teacher preparation and candidate support services,” said Dr. Judy Mantle, dean of the Sanford College of Education at National University. National University, through the National University System, also is the driving force expanding three programs inspired by the vision of philanthropist T. Denny Sanford to address critical needs in the education and nonprofit sectors. Sanford Harmony and Sanford Inspire provide innovative resources for the PreK-12 education sector; and the Sanford Institute of Philanthropy offers educational programs to help nonprofits become more effective at fundraising and donor relationships. National University has also been a leader in community partnership. National University offers employer scholarships, for example, through the City of San Diego as the city’s preferred employee education partner, and offers tuition scholarships in partnership with various school districts and public agencies. It also has a partnership with the San Diego Zoo to support educational programs and workshops for teachers. “National University believes strongly in giving back to the communities we serve through our educational partnerships and collaborations that allow us to foster innovative learning environments that encourage students to contribute to our regional and global economies,” said Dr. Nancy Rohland-Heinrich, executive vice president of National University. The Classroom of the Future Foundation’s mission is to unite the business and education communities to create innovative learning environments in San Diego public schools that prepare students to thrive in our global competitive societies. The nonprofit that has contributed nearly $10 million to educational programs throughout San Diego County and has provided $400,000 in scholarships to high-tech scholars. The Innovation in Education Awards event brings together more than 500 educators and business leaders to highlight exceptional students as well as champions of educational innovation in the community.